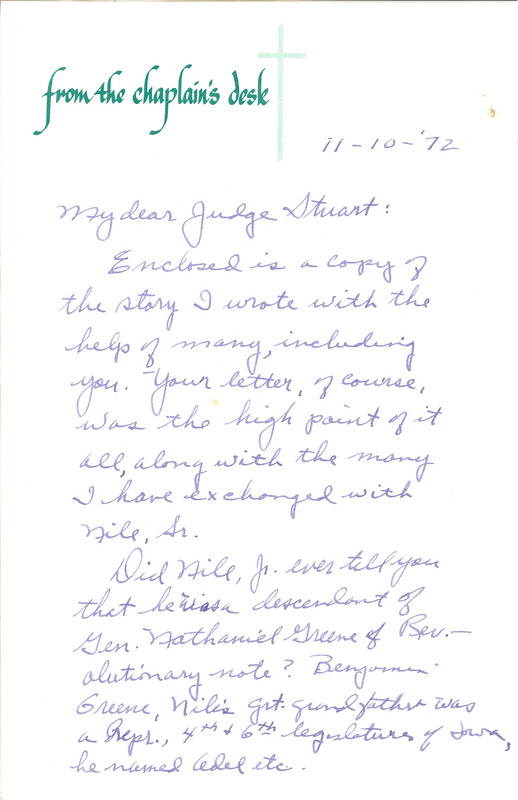 from the chaplain's desk 11-10-'72 My dear Judge Stuart: Enclosed is a copy of the story I wrote with the help of many, including you. Your letter, of course, was the high point of it all, along with the many I have exchanged with Nile, Sr. Did Nile, Jr. ever tell you that he was a descendant of Gen. Nathaniel Greene of Revolutionary note? Benjamin Greene, Niles grt. grandfather was a Repr., 4th & 6th legislatures of Iowa, he named Adel etc.